Made Wordless On Wednesday by Running into a Turkey at Work Repeatedly - JP loves LIFE! I know, it’s a bit of a joke with me tweeting about the turkey I keep running into at work at Monsanto’s World Headquarters, but I had to share it. 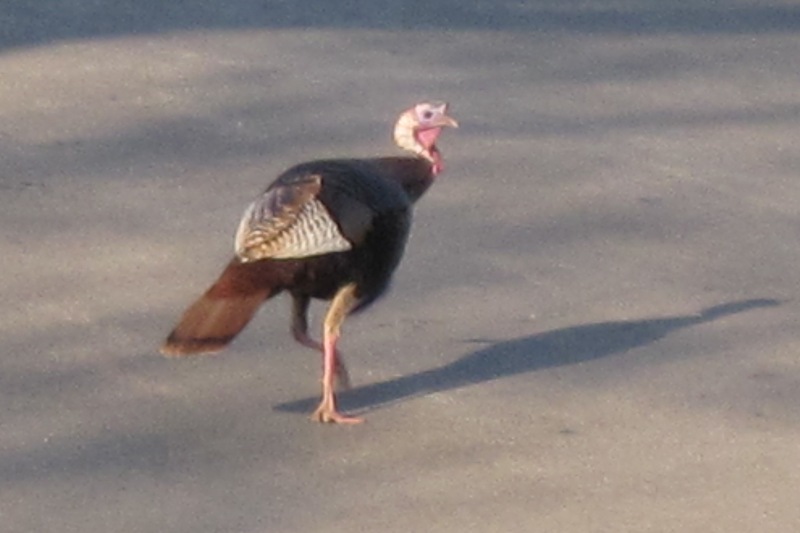 And I have to tell you I have been running into this turkey quite a bit recently! And although I’m going ahead and posting it on Tuesday night, these pics were indeed taken on Wednesday but I’d already done my WW. Seems it knows spring is the perfect time to stretch its legs too! Monsanto has a commitment to the environment that includes a volunteer team of employees (many of whom have advanced ecological degrees) and the grounds maintenance team. These folks come together on a Wildlife Habitat Council that works on the site’s open areas encouraging native plants and birds. You can read more on the company’s website. 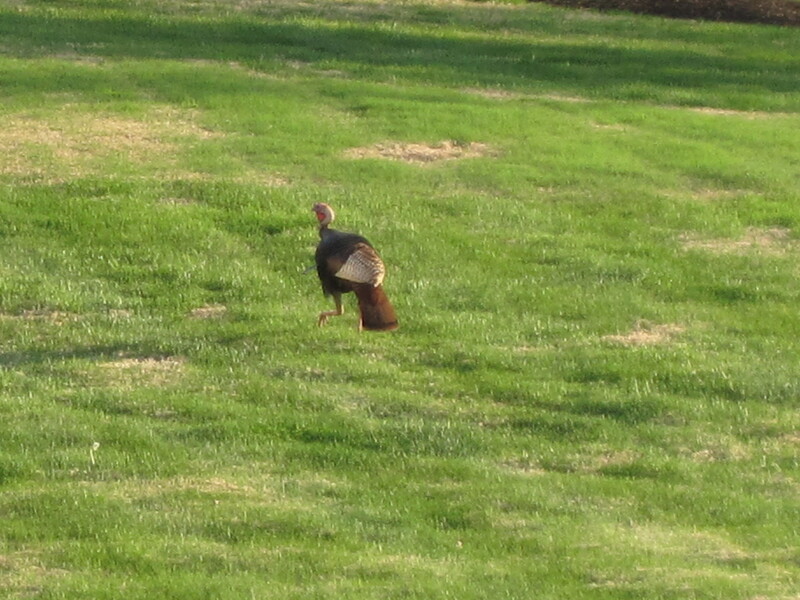 So you shouldn’t be surprised if you run into a turkey or two at Monsanto! 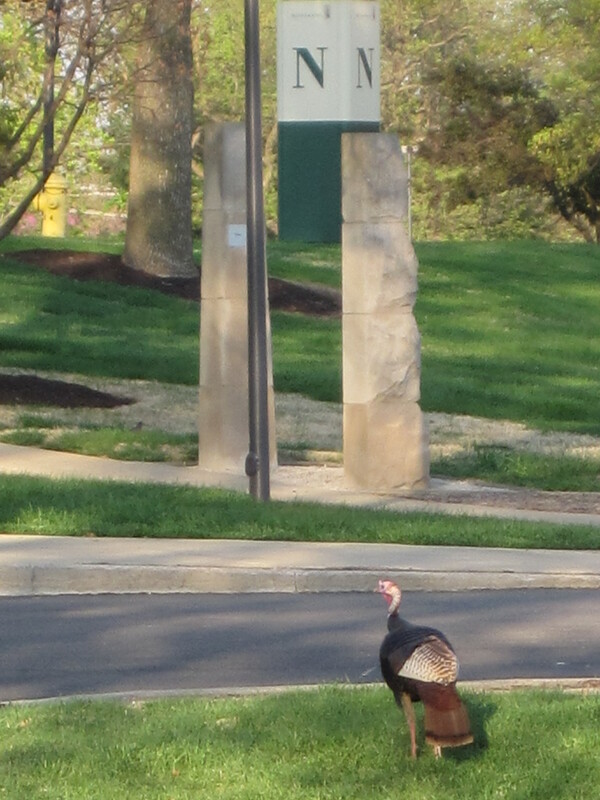 I still remember my first turkey encounter on campus and it was years ago! So fun! We have seen quite a few turkeys around here this year – many more than usual. And then a friend found out the hard way what happens when a turkey hits your windshield at 70 mph! Uh oh! That wouldn’t be good! Stay safe with the storms Steve & don’t let any flying turkeys hit ya! Oh my goodness…does he not look out of place! So happy to know he is allowed to feel right at home tho. There are some great woods and all on the site too… just think the sun felt so good he did a big walkabout! Glad he has a safe place since he doesn’t know he is supposed to be in the country! LOL! The city has lots of turkeys, they just don’t all have feathers! I almost ran over this guy (or one of his friends) the other day after picking up my son from the Monsanto daycare. One of the turkeys freaked me out when I was first coming up here. I was distracted walking up to C building & came around the corner and think we both got surprised cause he made noise. Surprised the heck out of me but then I busted out laughing! Have a great day, give your little dude a snuggle for me. Thanks for linking up on WW, JP! Our trees are full of wild turkeys. This one maybe made the trek from the prairie to St. Louis. That would be a long way to come but your winter could drive people and animals to do amazing things! The little guy certainly appears comfortable in there. I don’t see turkeys in my city but we do have a large population of Canada geese and mallards. It’s often funny to see a family of geese lazily crossing a busy street, traffic coming to a halt as the birds take their sweet time walking by. Humans and wildlife must learn to co-exist, increasingly we share the same habitat and compete for limited resources. That’s why it’s important for government agencies and even business to set aside land so that these species can thrive lest they become endangered. I agree Joseph and am proud to be part of a company that does this routinely at our sites, not just in one location. Everyone of us can make a difference, in fact, the only way to make a difference is one person at a time! We’ve been seeing turkeys several times a day here on our dirt road lately, love watching them as long as they stay out of my veggie patch! LOL! I wish I could warn them for ya!